These days, we use phones to do a lot of different things. But over time, they can get cluttered. Which is why millions of people use the Files app to keep their phones organized and clean. But what about the outside of your phone? There are a lot of ways to keep your phone clean. You can even get specialized hardware. But what if there was a way for your phone to keep itself clean from the inside out? Introducing a new feature in the Files app: Screen Cleaner. Screen Cleaner uses the Smudge Detector API to identify imperfections. 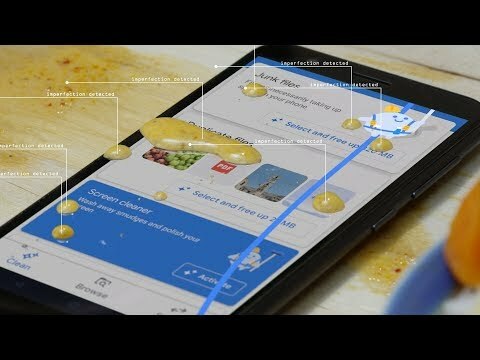 forming a long-lasting non-stick shield around the surface of the phone. So with just a few taps, your screen is like new, with a fresh pineapple scent. Keep your phone clean, inside and out.